FOR A BULK DISCOUNT SELECT A LARGER PACK SIZE ABOVE. All our reconditioned trolleys are fully serviced, re-plated and new casters installed. They are a great option, like new. 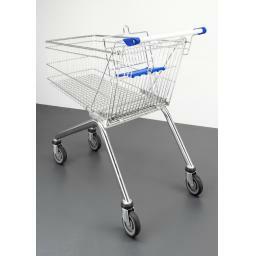 *NB Please note that our stock of used trolleys does vary according to what we have been able to source. If we have any problems fulfilling your order we will call you ASAP. 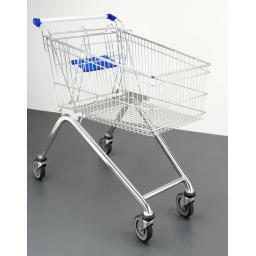 All orders that include trolleys are charged a flat carriage rate of £40 + VAT regardless of quantity ordered. Even single trolleys have to be packed and despatched on a pallet as they can not be boxed and shipped through our parcel network. This covers our basic carriage rate, packing charge (inc pallet and wrapping) and payment processing fee. This relates to all New and Refurbished Shopping Trolleys, Specialise trolleys and Pallet Trucks. All trolleys can be branded with logo handles, we can offer different block colour handle, ear and seats and we can have the wire trolleys painted or powder coated. In the workshop we can also fit A4 clip boards to handles, remove baby seats, add a basket divider, bumper trim around the edge and more. For a personalised quotation please email your requirements and we will respond with full costings and leadtime.